Thousands of Catalan separatists hit the streets of Barcelona on Sunday (25 March), vowing the arrest of former Catalan president Carles Puigdemont in Germany would not stop their push for independence. Despite the efforts of Puigdemont, who fled to Brussels after the Catalan parliament declared independence on 27 October and Madrid countered by taking control of the region, no European Union member state backed the secessionist cause. Catalan leader Carles Puigdemont arrested in Germany, he could be extradited to Spain to face charges of sedition and rebellion. 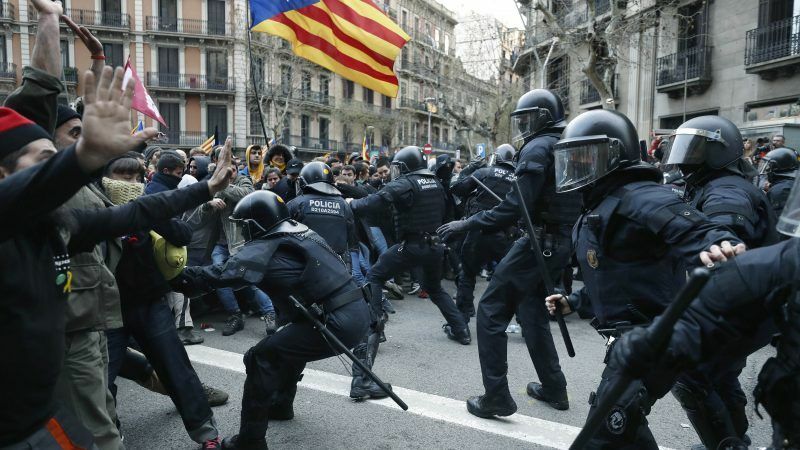 Protests have erupted in the streets of Barcelona. "The judge’s decision is completely disproportionate to dictate provisional imprisonement. We see no grounds for an accusation of rebellion which, as noted by several Spanish and International lawyers, requires a violent act, something that did not occur in the case of the former Catalan government members or pro-independence civil society leaders." "We urgently call for a new Catalan government to be appointed by the parliament so that political negotiations within Catalonia and with the central government can be started in order to find a political exit to the current deadlock. If Ratjoy keeps on the current track – imprisoning Catalan politicos – this will lead to civil war – as sure as I’m sitting here now. & the fault for this will lie with Rat-joy – who is truly Franco’s heir – authoritarian, a liar and leading a party that is fundamentally corrupt. With a bit of luck there is some dumb law in Spain about insulting the prime mincer – I do hope so – I look forward to the extradition case. Rat-joy/Franco – there is no difference.